New Revolutionary War books by Nathaniel Philbrick and Joseph Ellis ignore modern historical research. Why do popular histories of the War of Independence ignore modern scholarship? Every Independence Day the book industry offers new titles about the American Revolution, promising original thoughts and fresh relevance. This year is no different, with some of the nation’s most lauded historians releasing major new titles making bold claims of insight. Pulitzer Prize winner Joseph Ellis just came out with Revolutionary Summer, which focuses on the few months in 1776 when the 13 colonies declared independence. It comes on the heels of Penn professor Richard Beeman’s Our Lives, Our Fortunes, Our Sacred Honor, which also follows the road to 1776. And the National Book Award winner Nathaniel Philbrick’s Bunker Hill, already a best-seller, zooms in on the 1775 battle that transformed the conflict from a series of skirmishes into a full-blown war. These are carefully written books that are sensitive to contemporary attitudes. (Perhaps occasionally too sensitive.) But you’d be mistaken in thinking that they provide a new perspective on the Revolution, because none of them seriously consider much of the latest research being done by historians across the country—which has a lot of new and relevant things to say. If you bought a popular book on science, one that came with a similar sheen of intellectual prestige, and learned that it essentially ignored years’ worth of scholarship, you’d demand your money back. Why should history be any different? What all these authors share is an antiquated focus on high politics and military battles, areas that contemporary historical research has basically forsaken as irrelevant to the greater questions the Revolution raises. Beeman’s book is essentially a character study of the 56 delegates, virtually unknown to each other, who met in Philadelphia in 1774 to convene the inaugural Continental Congress. Though noting their flaws, he ultimately celebrates their audacity—“the importance of leadership”—in declaring independence. You walk away from Our Lives with the undeniable impression that the Founding Fathers really were giants, however flawed, who single-handedly created American democracy. Philbrick’s giant isn’t a founder but a founder’s doctor: Dr. Joseph Warren, the personal physician of John Adams and president of Massachusetts’ first independent legislature. He embodied the country’s future democratic ideals—a visionary, Philbrick calls him, a forgotten hero who “had seen the future.” When the Battle of Bunker Hill broke out, Warren volunteered for the front lines, where he was soon shot in the face. Warren’s death at 34 briefly galvanized the patriots, but Philbrick makes us believe that men like him ultimately won the war. What saves them from defeat are the tactical mistakes made by a handful of British generals, who nonetheless lead what Ellis portrays as the most powerful military that ever existed. That, and a tyrannical British government that alienates liberty-loving Americans. Washington’s troops hold off the British just long enough for the Founders to declare independence, at which point, Ellis argues, there’s no turning back. In the end, democracy is conceived in the summer of ’76, a period that showed “how true each side was to the core values it claimed to be fighting for.” Even Ellis, the most skeptical of these historians, can’t help but locate the roots of democracy in a few well-worn moments. These pop histories make arguments I haven’t seen scholars of the Revolution make in years. Implicit in all of them is the notion that the founders’ professed ideas of liberty and equality truly rallied colonists to their cause. It’s a comforting thought, but one that flies in the face of the latest research. For most of the war, the majority of colonists probably wanted nothing to do with the conflict, an argument emphasized at a recent Penn conference of leading scholars. Battlefield successes and Britain’s heavy-handed tactics may have boosted the patriots’ appeal, but it’s misleading to call their cause genuinely “popular.” To gain supporters, local patriot leaders often relied on fear and intimidation, not appeals to hearts and minds. 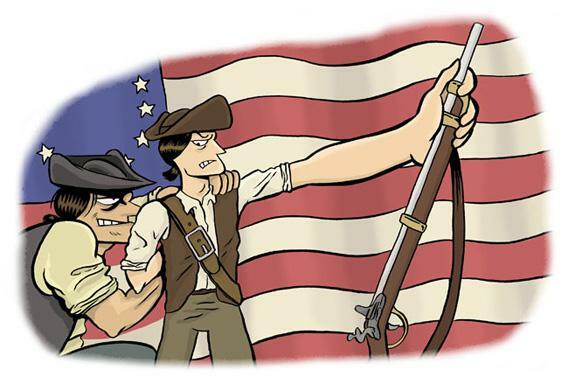 In most towns, for instance, patriots created vigilante groups, called Committees of Safety, that forced colonists to take loyalty oaths, swearing to turn in anyone deemed suspicious. During the war, in other words, colonial America may have felt more like the Soviet Union than a free and open republic. These days, academic historians also avoid studying battles or the founders in isolation. It’s much more common to place the Revolution in its global context, which has led to some provocative insights. Look at what happens, for instance, when you view the war from the standpoint of England. In his new academic press book, The Men Who Lost America, Andrew O’Shaughnessy shows that the British mismanaged the war not because they were unabashed tyrants but precisely the opposite: They were struggling to manage the most democratic government the world had ever seen. Britain’s popularly elected parliament never had more power than in the 1770s. But partisan politics paralyzed the government. Legislators were divided over how to respond to the American protests, and a free press only fanned the factional flames. King George III, an avid supporter of the Enlightenment, advocated a powerful display of force abroad in part to assert control over his nascent democracy at home. George III expected an easy victory, but the conflict quickly turned into a world war. France’s entry in 1778 exposed the true weakness of Britain’s navy. It was stretched thin as ships were diverted from North America to protect the empire’s far-flung colonies in India, Africa, and the Caribbean, which were suddenly under threat. O’Shaughnessy gives plenty of credit to the patriots’ zeal (Ellis might even argue too much). But he is less gimlet-eyed about why they fought. It had less to do with vague notions of freedom—what Ellis only slightly skeptically calls “The Cause”—despite the comforting balm those ideas provided at the time for many colonists, and for us readers now. But it had a lot to do with the popular outrage the British caused when they incited Indian tribes against the colonists. And it had much to do with Britain’s decision to arm slaves in exchange for their freedom. Ellis, Beeman, and Philbrick treat the arming of slaves as a footnote, if at all. In a sense they have no choice, since they focus on a few brief episodes in the 1770s, when the war was largely confined to the north. But the conflict drastically transformed when it shifted to the south, in 1778. The new books virtually ignore the region, instead concentrating on a handful of northern events that are forced to hold the entire meaning of the Revolution. A longer view that included the final war years, and by necessity the south, would have revealed a much more complicated conflict than anything like the Battle of Bunker Hill can shoulder. Take what happened in Virginia, where the war was ultimately won. Wealthy planters were happy to champion liberty so long as their lives weren’t put on the line, as an article in a forthcoming collection of scholarly articles shows. They paid poorer men to fight for them, and when they tried to institute a draft, less affluent Virginians rebelled, knowing they’d be forced to carry the burden. The rioters demanded a volunteer militia, and at a high price: They wanted land as payment, and, just as importantly, slaves to cultivate that land with. Virginia’s elites grudgingly conceded, confiscating slaves from abandoned loyalist plantations, and handing out Native American lands that the British had given up after the war ended. Even still, when the patriots won at Yorktown, Va., in 1781, the battle that ended the war, Virginia’s militia made up just 20 percent of the patriots’ 15,000 troops. The Continental Army, most of them northerners, provided about one-third, and more than one-half were French. These new pop histories of the Revolution are oblivious to the war’s global dimensions, as well as the quotidian reality of ordinary colonists, despite their claims to the contrary. They naively indulge the Revolution’s idealistic rhetoric, even if they dutifully note how those words failed to be put into practice. It makes sense; after all, there’s nothing’s less romantic than the complicated, disheartening truths of war-torn societies. The irony is that these new histories all try, rightly, to make the Revolution seem relevant again. Yet paying more attention to the new scholarship would show how much more similar the Revolution was to our own wars now. Perhaps there’s a lesson we could learn from the Revolution’s losers, the British, for instance. They took on what looked like an easy war abroad to patch over partisan divisions at home, yet nonetheless lost the war because of imperial overreach. Or perhaps we could learn something from the vast majority of ambivalent colonists, the ones unsure whether the war was even worth it. The Revolution scared them, or held false promises. Their experience provides a sobering lesson about the hubris of war, but one we can still thank them for today. Revolutionary Summer: The Birth of American Independence by Joseph Ellis. Knopf. Our Lives, Our Fortunes, Our Sacred Honor: The Forging of American Independence, 1774-1776 by Richard Beeman. Basic Books. Bunker Hill: A City, a Siege, a Revolution by Nathaniel Philbrick. Viking.